Rarely has the fate of a single person had such momentous political consequences. The disappearance – and probable murder – of a Saudi journalist in Istanbul two weeks ago has caused an international furore involving President Trump, the Secretary-General of the United Nations and leaders of all Western Europe. It threatens to destabilise the most powerful nation in the Middle East and sever crucial defence and oil contracts between the West and its biggest oil supplier. It also threatens to sabotage Western efforts to punish Russia for mendacious deceptions over the Skripal case. Jamal Khashoggi, a leading Saudi journalist who became a fierce critic of the powerful Saudi crown prince, Mohammed bin Salman, walked into the Saudi consulate in Istanbul on 2 October to register his forthcoming marriage to a Turkish woman. He was never seen again. After mounting speculation, Turkish officials announced, unofficially, that he had probably been murdered inside the consulate by a hit squad sent to Istanbul only a day before his disappearance. More gruesomely, they said his body may have been cut up with a chain-saw by the Saudis, removed from the building in bags and flown out of the country on two private jets that brought in the hit squad. After days of silence, the Saudis denounced the story as a lie, invited Turkish officials to inspect the consulate and said that they were also investigating Khashoggi’s disappearance. Increasing the pressure on the Saudis, the Turks then said they had voice recordings of Khashoggi being interrogated, tortured and killed inside the consulate and demanded a full explanation. There are video recordings of him entering the building. There is no recording of him ever leaving it. The political repercussions are immense. If Khashoggi – well-known in America as a regular columnist of The Washington Post and critic of the Saudi government – was indeed murdered, comparisons with the Skripal case are obvious. In both cases, a dictatorial leader has authorised the murder of one of its citizens in a foreign country by men sent there specially to kill him. The Skripals survived the attempt to poison them with chemical weapons in the English town of Salisbury; Khashoggi’s fate is unknown, but he has been similarly targeted because he angered a ruler intolerant of criticism. After the poisoning of the Skripals, Britain persuaded its western allies to take a very tough stand against Moscow. Dozens of Russian diplomats were expelled from Europe, America and even Australia. Official contacts with Russia were cut back. Visits were cancelled. And Britain and the Netherlands have recently exposed the suspects in the attempted murder and shown how the GRU military intelligence agency, to which they belonged, has attempted to disrupt, bug and infiltrate all subsequent investigations into the use of novichok, the chemical used to poison the Skripals. Should the West now take a similarly tough stand against Saudi Arabia? If it does not, the campaign against Russia will be seen by many as hypocritical and the Kremlin will denounce it as simply a Western attempt to blacken Russia’s reputation. But any tough political action against Saudi Arabia could be disastrous for the West. The country is the world’s biggest oil producer. It is one of the biggest purchasers of American and British arms. It is the dominant economic and political power in the Middle East and the key to attempts to stamp out Islamist terrorism. And it is vital to America’s attempt to curb the power and influence of Iran. So far, Western leaders have only expressed their concern and demanded explanations from Riyadh. But the pressure is mounting fast. President Trump, one of the main supporters of MBS, as Mohammed bin Salman is commonly known, has announced that the United States would inflict “severe punishment” on Saudi Arabia if the kingdom was found to be responsible for Khashoggi’s death. He said he would be “very upset and angry”. He ruled out halting big military contracts, but the blow to the US-Saudi alliance, the key to politics in the Middle East since the end of the Second World War, would be devastating. 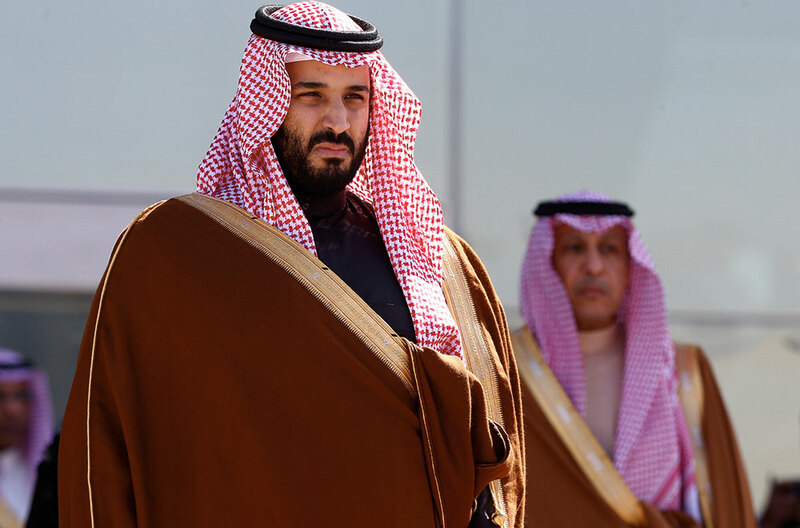 It could lead to the overthrow of MBS – whose dictatorial and impulsive tendencies are now viewed with increasing alarm by other Saudi princes, by the alienated Muslim clergy and by human rights activists. If Western pressure continues, this could lead to an economic crisis in the kingdom. Saudi Arabia is already suffering from a budget deficit and a massive financial drain on its savings, uncertainly over the future of its state oil-producing company and high graduate unemployment among its elite. Foreign investors have already announced that they will not go ahead with planned investment in the country. And Saudi money is now being shunned abroad: the British business tycoon Sir Richard Branson has halted plans for Saudi investment of $1 billion in his various companies. Dozens of top world business leaders invited to a Saudi investment conference in Riyadh on 23 October have now pulled out – including the president of the World Bank, heads of big western banks and the heads of global businesses such as AOL and Uber. Saudi Arabia is now under pressure to offer an explanation. Even if Khashoggi is still alive and has been kidnapped and smuggled back to Saudi Arabia, there will be a massive outcry, even if he is publicly shown. The incident has also changed western perceptions of MBS, until recently seen as a reformer who was brave enough to tackle corruption among the Saudi elite, challenge the power of the religious establishment and allow women some more rights, including the right to drive. Now, however, he is seen as paranoid and intolerant of all criticism: he has imprisoned women human rights activists, he has silenced his critics, muzzled the press and alienated many leading figures in the extended royal family by his autocratic ways. Khashoggi was a critic, but he was still loyal to his country. If he has been murdered for his views, the outlook for any critic of MBS is bleak. His foreign policy is also now seen as impetuous and dangerous – especially the war he launched in Yemen and the country’s ill-conceived attempt to impose a political and economic blockade of Qatar, its small but rich Gulf neighbor. The Turks, recently denounced by their western allies for President Erdogan’s dictatorial tendencies, are now raising the stakes. Erdogan has a deep quarrel with the Saudis over the future of Syria, and is now doing his best to embarrass them over Khashoggi and reassert Turkish leadership of Sunni Muslims. At the same time, Turkey is moving to improve its relations with the Trump administration. It has released an American pastor who was accused to terrorism. It has ended its quarrel with the Americans over visas. And it has stabilised the currency in an attempt to reassure foreign investors. The Khashoggi affair could have global consequences if it prompts either the removal of MBS from power in Saudi Arabia, an increase in Russian influence in the region or the collapse of a key American ally in Washington’s attempt to reimpose sanctions on Iran. For this reason, it is being investigated at the highest level. António Guterres, the UN Secretary-General, has demanded the “truth” about the journalist’s disappearance, and expressed fears that such actions will only lead to more extra-judiciary killings and “disappearances”. Two key countries have so far expressed no view on the matter and are unlikely to do so – China and Russia. China has massive and growing trade links with Saudi Arabia, which it wants to reinforce as it attempts to fight a trade war against America. And the Kremlin may seek to benefit from any change in government in Riyadh that weakens the alliance with America. In any case, Mr Putin may be relieved to see that the global opprobrium against Russia over the Skripals has now focused on another issue.